Somebody suggested I review Internet cat videos. Me, expert on auteur theory and postmodern European cinema, analyzing cat videos. Please. What could be more frivolous? 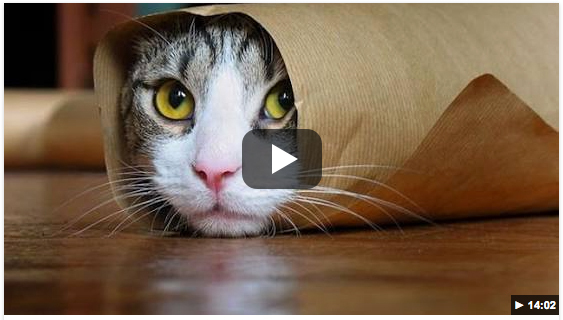 I don’t feel I am ceding ground to admit that I did, in fact, watch a cute cat video this afternoon. Waiting to see my dentist, not a single issue of Film Comment to be found. So I pulled out my phone and watched “Funny Cats Compilation (Must See) Funny Cat Videos Ever Part 1.” An odd, redundant, (grammatically suspect) title, presupposing a sequel. Music was trite, obvious. I have to admit that the grating quality sometimes provided ironic commentary on the images, especially when the soundtrack ran counterpoint to background music in a scene. Subtitles were in a strange font, and I’m not sure if they were intended to show what the cats were thinking, as much as what the editor wanted us to think they were thinking. Ethically questionable. 34,397,949 views, greater than the number of tickets sold to every movie I’ve reviewed over the past four years combined. PussPuss57 has a surprisingly light touch for the genre. His (her?) opus is three minutes of a Turkish Angora and a slightly out-of-tune Steinway. It’s variations on a theme of course, rarely obvious yet replete with universal observations about the glorious futility of the artistic process itself. I must also admit an affection for m3ow315’s series about a Chartreux and a bidet – delightful. One might wish for greater diversity in the acting pool: the American Shorthair is entirely too prevalent for my taste, consistently derivative in its choices, whither squeaky toy or large dog; “overdone” is perhaps too kind. Eureka – found an archive/index for cat videos on huffingtonpost.com. Well curated, practically endless (makes the Serial Subreddit look like CliffsNotes.) Cogent commentary. Saw a few pieces I hadn’t come across yet: Cats Giving Dogs Massages was charming, although Your Cat May Be Trying To Kill You is messing with me a bit. Taking the rest of the day off. Too many cat videos have the words ALL TIME! in the title. Just like that, all caps, exclamation mark. You know it’s hyperbole but you have to watch, because, well, what if it is? And of course it isn’t, your spirit takes another hit, and you’re already clicking on the next one. Three words: Funny. Cat. Vines. Brilliant. No setup – just six seconds of climax. Like mainlining cuteness. Can do thousands of vines instead of just hundreds of trad videos. Love to loop my favs. The facility is very nice. No Internet connection, of course. They wouldn’t let me rent Cat People (1982). Somebody let Alien (1979) slip through, but now I think that might have been part of my therapy. Watched Austin Powers (1997) ‘cause they didn’t see it coming – Mr. Bigglesworth is precious – then moved on to Garfield (2004). There’s a cinematic universe I never knew existed. It’s a cute cat world, and we just live in it. I’ve got some Disney coming soon, as long as the Redbox isn’t out. (LOL) Can’t. Wait.